by Eric Bailey, Kevin Carter, Elaine Cunningham, Adam Daigle, Mike Ferguson, Joshua J. Frost, James Jacobs, Steve Kenson, Rob Manning, Colin McComb, Alison McKenzie, China Miéville, Brock Mitchel-Slentz, Jason Nelson, Richard Pett, Chris Pramas, Jeff Quick, Sean K Reynolds, F. Wesley Schneider, Neil Spicer, Lisa Stevens, Matthew Stinson, and John Wick. In the official Pathfinder campaign setting of Golarion, the River Kingdoms is an area intentionally underdeveloped to give room for the GM and players to create or import their own fictional creations without clashing against established canonical countries. The River Kingdoms are really a couple of dozen small, independent nations that range from small city-states to bandit fortresses; all they have in common is dependence on the River Sellen. One of the River Kingdoms, the Stolen Lands, is the site of the Kingmaker Adventure Path, a campaign that sees PCs carving out their own state. 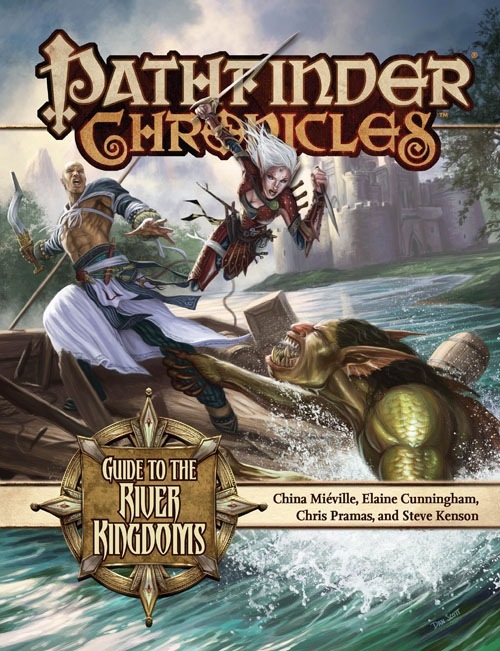 The Guide to the River Kingdoms provides short descriptions of 22 different areas, and although it’s certainly not comprehensive in detail, it provides enough of an introductory overview to get creative GMs on the right track. 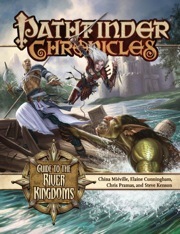 Interestingly, each of the areas is written by a different author, and Paizo was able to get some big names (like China Mieville and Elaine Cunningham) to contribute. The inside front cover is a map of the River Kingdoms, showing the different branches of the Sellen, notable settlements and ruins, and the wavy borders between the different kingdoms. The book starts with a nine-page overview that talks about life in the River Kingdoms, with a focus on the Six River Freedoms, an unwritten code that binds the people of the disparate kingdoms together. There’s also a good discussion of how those countries that border the River Kingdoms interact with it. The section concludes with a brief entry for two minor deities widely worshipped in the River Kingdoms: Gyronna (hag goddess of hatred, extortion and spite) and Hanspur (god of rivers and river travel). I thought this section was really well done, and gives the River Kingdoms a unique niche in Golarion. •	Artume (1 page): Thug-ruled kingdom—forgettable. •	Cordelion (1 page): Xenophobic kingdom deep in the forest with elven ancestry—also forgettable. •	Gralton (4 pages): An interesting country formed by refugees from the inquisitions in Galt, with nobles forced out of necessity to take up trades while dreaming of returning to their homeland. I could imagine using Gralton in a storyline. •	Heibarr (1 page): A cool ghost city. •	Hymbria (1 page): An elven community with a dark side—not too shabby. •	Lambreth (4 pages): Great backstory of a kingdom rescued from Razmiri encroachment by a savior who was too good to be true. •	Linerthane (1 page): Nice little story of idealist paladin with a fortress and big dreams of someday fixing Galt. •	Loric Fells (1 page): Monster infested. •	Mivon (4 pages): Cowards who fled Brevoy while maintaining the Aldori sword-dueling ethos. The entry includes a good codified list of rules for Mivoni duelling. •	Mosswater (1 page): A good adventuring locale: a town long overrun by merrow. •	Nystra (1 page): A concept very similar to Mosswater, but this time the culprit is yellow musk creeper and strange insect-like gargoyles. •	Outsea (4 pages): My personal favourite of the bunch. Written by China Mieville, the backstory to this place is just crazy-ridiculous-cool. I have an Undine PFS character from Outsea, aided by a regional trait in Blood of the Elements. •	Pitax (4 pages): Interesting, politically-divided town that is infested by thieves. A good place to start a campaign, as it could support various themes. •	The Protectorate of the Black Marquis (2 pages): Pirate despot town with interesting backstory. •	Riverton (1 page): Theocracy with a great cult leader. •	Scrawning Crossing (1 page): Classic “all villagers mysteriously disappeared one night” hook. •	Sevenarches (4 pages): Original kingdom ruled by druids, with fey support, with no elves allowed due to mysterious disease. •	The Stolen Lands (4 pages): As I mentioned, this is apparently where Kingmaker takes place. From the description here, it’s hard to imagine why anyone would *want* to make a kingdom in this sh#*hole. •	Touvette (2 pages): Harsh, lawful kingdom. •	Tymon (4 pages): Lisa Stevens’ baby, a gladiatorial kingdom with a constantly reincarnated leader who has been running the joint for 2,700 years! •	Uringen (4 pages): Adam Daigle’s baby, a fun concept of a town partially “unstuck” in a pocket dimension. Great place for adventures that players haven’t seen before. As indicated above, the quality of the entries varies, with some really great ideas and some fairly generic ones. Although the cover art is great, the interior art is very much a mixed bag. The bullet point on the back cover about “New feats, spells, class abilities, and poisons” is literally true but hyperbolically misleading—this is *not* a crunch book, with only a handful of player options throughout. In one respect, however, this is good: with the launch of Pathfinder Second Edition, this book is just as valuable as it was in First Edition. All in all, I’d say this was a solid, average Paizo book. I wouldn’t rush out to buy it, but I certainly don’t regret owning it either. Obviously, those running something like Kingmaker or other campaigns set in the River Kingdoms will find it indispensable. Trying not to replicate the other reviews, this campaign setting is exactly that - a sketch of many different cities and city-states within a loosely defined country. The locations are creatively detailed, with the intent to provide a HUGE variety of rulers to parlay with as players build their own domain during the Kingmaker campaign. For that it works brilliantly! There are regions to trade with, city-states to provide problems for the new PC rulers, leaders to ally with, and locations to be explored. As I read through this sourcebook cover to cover (despite often finding it difficult to stay engaged with other PDFs), I couldn't help but think about the possibilities for many of the areas. Admittedly, as many of the other reviewers stated, this is light on crunch. If you are interested in stats, stay away from this product as there are only two gods with basic worshipper info, 5 new poisons, 1 spell, 1 alternate bard class ability, 1 region affinity, and 1 magic salve in the 32 pages. However, the nature of the sandbox campaign compliments Paizo's approach with this product: giving a huge range of idea-generating options for the GM to flesh out. The only thing I found wanting is the region to the east, immediately abutting the Stolen Lands, was not detailed as much as the other areas surrounding the campaign. However, that being said, if you are going to play Kingmaker I think the number and variety of kernels of adventure-generating encounters far outweighs that gripe. This is a somewhat strange campaign setting book, in the sense it seems not only is the various regions described in the book very different (from very regular fantasy tropes and/or very real world inspired) to the very fantastic... But how they are described also varies so much, because the authors do their pieces in very different ways. For example, one region might have a city statblock, a lot of info on people there that can be usefull and inspiring, written in an entertaining way... While at least one other is pretty much "there are these guys guarding something but I won't tell you much about either" over three pages. I found some of the articles in the book excellent, some average and some bad. As there is something to every taste here (except crunch, this is pretty much pure fluff), I guess that would be true for most people too. The River Kingdoms is one of the more interesting settings for Golarion. Paizo does a nice job of keeping things detailed just enough to give creative GMs some leeway to add in some details of their own. Being a big fan of China Mieville, I greatly appreciated his contributions in the description of the unique city state of Outsea. There are some great sites of interest within one of the more standout areas of the campaign milieu that the PCs can explore. For example, a town that is a town but not a town... Can't say more as I don't wish to spoil it for any upcoming readers. If you're thinking about using Paizo's next AP- Kingmaker, I strongly recommend purchasing this sourcebook. I too wish there were more NPCs in the sourcebook but the material was an intriguing read. I'm going with "soon to be announced AP". They're trying to short-circuit the part of our brain that stops us from hitting "add to cart" every time we see it with all these announcements! Legacy of Fire is AP #4. It's the one we're going to be launching in a few weeks. Council of Thieves is AP #5. It launches at Gen Con, and will be the first PF RPG AP. Wouldn't that be a bad thing? I just noticed that this post was there... huh. many <= 4, when the next announcements are going to be made. Wow, River Kingdoms AP? That sounds fun, could the end result be the PCs ruling their own robber barony? Huzzar, months of wild speculation and intense dissection of any sentence that falls from James' lips/pen/keyboard. All I know so far is that this will be the first AP in which the PCs begin as Vargouilles questing for ancient magics that will return their bodies. Gosh I hope so. I've been trying to write my own campaign based in the river kingdoms along just those lines. Anyways a Chronicle for the River Kingdoms will be very helpful either way. And that is followed by KINGSLAYER and that is followed by Clash of the Kingslayers... hmmm... don't we already have that? Is that a prequel AP? Apisode One? Just kidding around. I find the chaotic political environment of the River Kingdoms ideal for an Adventure Path. Whoa....Kingmaker. I can't believe missed that earlier in the week. That is quite a teaser. I was hoping it would have been done by Ed Greenwood. No offence meant James. Has Paizo approached Ed about doing one of the Pathfinder Books? James Jacobs is our standard placeholder for all products that we don't know who the author is. He won't be writing this book as far as I know, and we haven't announced who will be yet. Once we have an author, we'll change the name on the website here. Thanks. Still hoping for an Ed Greenwood Pathfinder Book. That would be pure win. Do you know that Ed contributed to the Pathfinder Chronicles Campaign Setting book? In terms of actual content/inspiration, I wouldn't mind seeing a nod or two towards Moorcock's Young Kingdoms. In any case, we haven't announced who's writing this book yet, mostly because we're still assigning parts of the book. It won't be by one author, though... that's all I know for sure right now. I wonder if two months is enough "many". Mr Mona has let slip some stuff about Kingmaker here. I am looking to these kingdoms with great interest. Kingmaker is also the name of a Neverwinter Nights premium module sold by Bioware. I guess that's not a problem though since it's a video game rather than a tabletop game? Hmm, perhaps they should change the name. People might read too much into that. Oh, for crying out loud. Kingmaker is also a boardgame from the 1970s about the War of the Roses, a British Indie Rock band, a Marvel comics character, and the bloody 16th Earl of Warwick, with whom the term originates. Nobody's going to be confused or litigious about this because Neverwinter Nights went to the well, too. Yeah, I hate flip-floppers. Why can't we just count on people to be good Yorkists? Right-thinking is invasive. Being right-thinking about Pathfinder increases your chances of being right-thinking about Good King Richard. I'm waiting for somebody to sign on to the compatibility license and offer a historically accurate (i.e., Ricardist) War of the Roses sourcebook. I'm a shameless threadjacker, sorry. Respect for Old Dicky Neville is secondary to my needs than that we use the X-Men villain whose power was loan sharkery. Neville was an opportunist, not a loyalist, no? You've got too many shark things going on in different threads. I'm having to look too many things up! Marshall to Thetford with 50 men! Man, I gotta keep an eye out for a copy of that game. It's OOP, right? Learn something new every day. I never heard of any of that stuff you mentioned but I think the 16th Earl of Warwick gets the title. Of course, this is also where GRRM gets some of his inspiration for the titular head of the Lannisters. But since you're a Ricardist, all is forgiven. A few years back, I was asked to write an article entitled "Richard III and the Princes in the Tower" for Renaissance Magazine. I started out a traditionalist, but by the time I'd read a stack of books (I always do way too much research) arguing both sides (actually, "several sides" would be more accurate), I ended up firmly in the Richardist camp. And yes, a War of the Roses source book sounds like a pretty good idea to me. So, how far ahead do you guys try and get the cover art done? Like this is a Dec. release, but with it going to the printers, wouldn't it need to be done like next month? Covers usually go up a month or so before the release of the product, they may have some, but they are rarely put up on the website until a month or so before the product. Hope that helps. What about the Game of Porcelain Thrones? We generally try to order art for covers very early, often six months or more before the book ships to the printer. But also, we give our cover artists a long time to perfect the covers. In addition, the actual design of the cover usually ends up being one of the last steps in the process. As for shipping to printer dates, those are generally 2 months before release... so we're still five months ahead of when we'll have to start thinking about that for this product.